Why was Professor Young Kun Kim, 87, murdered for $300 at the Broadway/96th St. Citibank ATM two Sundays ago, at 5:30 PM? There are many questions about the crime and the background of Matthew Lee, the alleged assailant caught on camera delivering a brutal beating. Are ATMs safe after hours? 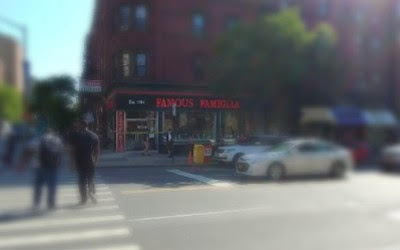 Unsafe lobby renovation forces evacuation of the Famiglia building @ Amsterdam/96th St.; Riverside Park Conservancy has a new leader; Joan of Arc Fete this Wed 5/30, 5-8 PM, Free music and macarons; Read on! Our prayers and sympathy are with the family of our neighbor, Young Kun Kim, who retired in January after serving 50 years as a political science professor at Lehman College. He was a graduate of Columbia University, and a West 90s resident. Professor Kim was beaten to death on Sunday, May 13th, while withdrawing $300 from an ATM at the Citibank on Broadway at West 96th Street at 5:30 in the afternoon. Swift work by detectives from NYPD Manhattan North and the 24th Precinct helped identify a suspect, Matthew Lee, a 50-year old Upper West Side resident whose only prior arrest was for an assault 34 years ago. During his perp walk, Lee told reporters that he had no recall of the incident, while claiming to have amnesia or having been “affected by demons.” Police told N90s that they had no record of Mr. Matthew living in a shelter or supported facility in our neighborhood. For many years, Riverside Park was run by one man with two hats. John Herrold, served as both Riverside Park Administrator and CEO of the Riverside Park Conservancy, the private non-profit fundraising arm. Enter Dan Garodnick, a former East Side City Council member who assumes the role of CEO/President of the Riverside Park Conservancy (RPC), while Mr. Herrold continues in his City position, Park Administrator . Under Mr. Herrold, Riverside Park completed the addition of its new southern tier, between 59th and 72nd Streets. The park has also added considerable assets, including bike-pedestrian paths between 79th and 90th, and walkways along the river extending all the way to Washington Heights. At the same time, the Conservancy has also grown, and with it demands for raising the quality of the park experience. Five years ago, the Board of N90s met with Mr Garodnick, and we found him to be very bright and tuned into the City’s issues in his role then as an East Side City Council Member. We know that this experience will serve RPC well. Riverside Park, like many city parks that don’t start with the word “Central” needs vigorous development efforts to offset an aging infrastructure. There are also many more cultural and recreational programs that a growing Conservancy can help support. We wish Mr. Garodnick great success. He has a big hat to fill. The Riverside Park Conservancy and the Joan of Arc Statue Committee invite you to our annual fête on Wednesday, May 30 from 5:00 – 8:00 pm, at West 93rd Street & Riverside Drive. The celebration coincides with St. Joan’s Feast Day. Live music by Via Paris Jazz Band and macarons by Laduree. Late last week the Department of Buildings issued an immediate vacate order for the entire building at the corner of Amsterdam Avenue and West 96th Street. The property houses the pizzeria Famous Famiglia. Warning notices, yellow tape across the now empty eatery entrance, and stacked chairs bear a sad testimony to lobby renovation work that made the building unstable. The sun had barely risen over Manhattan this past Wednesday morning when a knife fight broke out at the Freedom House shelter at 316 West 95th St., at 7 AM. The NYPD responded promptly, as they often do at this troubled shelter. The incident followed closely on a fistfight the night before on West End and 95th Street, a favorite spot for drug dealers. Neighborhood In The Nineties has formally requested that HRA and Council Member Helen Rosenthal reconvene the Community Advisory Board (CAB) for the shelter. The CAB hasn’t met since January. The Council Member and neighbors are frustrated at the disingenuous responses from Aguila, the vendor, and the inability of the City’s Social Services bureaucracy to hold them accountable. June is a critical month. The Aguila contract to operate the shelter ends, and once again rumors are flying that they will be fired. N90s is restarting a private guard patrol for the 93-95 area in June due in part to the destabilizing factors caused by the incompetently run shelter. City Comptroller Scott Stringer is now promising an investigation. Perhaps it is time for him to audit Aguila again. Residents of the Neighborhood In The Nineties area, Riverside Drive to Amsterdam Avenue, 90th to 98th Streets, may subscribe to our newsletter at www.N90s.org or info@N90s.org. Founded in 1971, N90s is dedicated to protecting the public safety and quality of life in our beautiful neighborhood, while ensuring the delivery of municipal services and Fair Share protection under the City Charter.